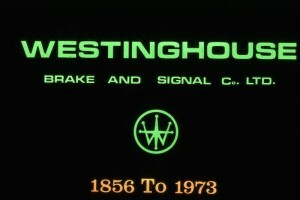 Since Saxby took out his first patent for railway signalling apparatus in 1856 and subsequently set up Saxby & Farmer, a large number of Companies joined and left the Westinghouse fold. This series of pages mentions just some of the more significant companies, explains their significance and points to relevant resources where appropriate. This is a little bit of a minefield since the various sources do not all agree with each other about the chronology of the events mentioned here. In a few places dates and sequences of events will necessarily be vague. We have also not provided enormous detail since in each case this will easily be – and in many cases has been – sufficient subject matter for other publications. The major sources for these summaries are a 1974 ‘History of Westinghouse’ presentation, recently discovered complete with its accompanying slide carousels, and ‘A Hundred Years of Speed with Safety’. Neither of these publications are immune to Westinghouse folklore, legends or perpetuated inaccuracies. Please feel free to contact us if there are inaccuracies that can be identified, verified and corrected and we will be happy to update the offending articles.